Linda Sarsour and other leaders of anti-Trump movement arrested during protests outside Trump hotel. The four main organizers of the "A Day Without a Woman" protests in New York City were arrested for disorderly conduct Wednesday. Linda Sarsour, Tamika Mallory, Carmen Perez, and Bob Bland were arrested for blocking traffic near the Trump International Hotel in Manhattan. Police had instructed the protesters to disperse and warned them that they faced arrest if they did not comply. The protesters were released Wednesday night. 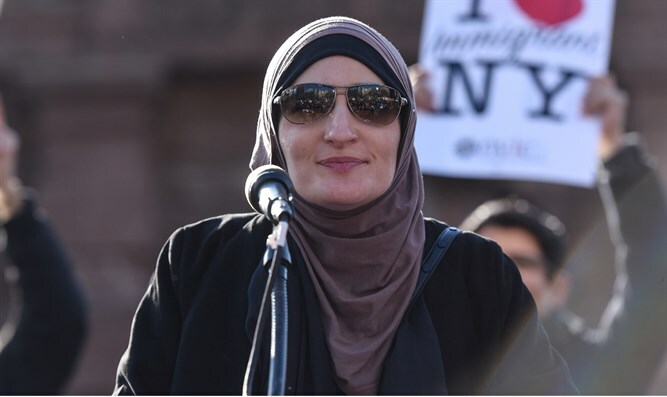 Sarsour, one of the leaders of the feminist anti-Trump Women's March, is the daughter of Palestinian Arab immigrants, and is a long-time anti-Israel activist and Sharia law apologist. Sarsour praised stone-throwing terrorists targeting Jews, calling such attacks “the definition of courage”, and decried Zionism as “creepy”. Another leader of the Women's March is Rasmea Odeh, an Arab terrorist who was convicted of taking part in a terrorist bombing in which two Hebrew University students were murdered and nine others injured.